Cordell is proud to announce that all non hardware specific products are now cloud compatible. You can put all of our products on your virtualized servers, removing all needs for proprietary hardware. 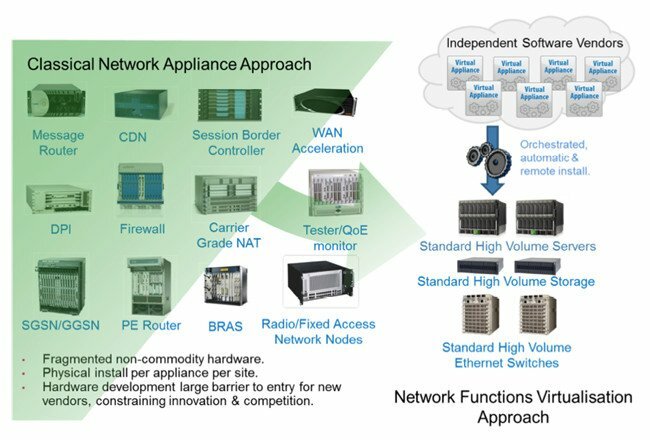 This approach works perfectly with the NFV (network functions virtualization) trend. NFV is transforming your network of proprietary boxes to collections of software components working together. This helps lower costs by decreasing the amount of servers needed to run all the software components. A decrease in servers lowers cooling costs, central office space, water usage, saving a significant amount of money. This is possible due to the advancements made in hardware in recent years. There are many benefits to having network functions virtualized. Implementation is significantly shortened due to lack of shipping, installing, and cabling. It also makes scaling the software licensing very simple. These are some of the biggest driving forces behind the NFV trend.